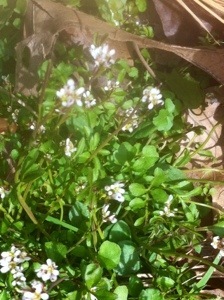 We spent the day at an Ostara festival yesterday. I went to an enCHANTment workshop in which I learned some new chants and “workshopped” an old one into something fresh. I have many skills as a priestess-ritualist, but leading people in songs/chants is not one of them! I introduced a song to this group (originally by Shawna Carol and beautiful, but slow paced) that I keep wanting to use to open rituals with in my own circle. I can’t “get it right,” so I asked them for help in creating something new with it that I could bring back to my own community to use. Anyway, this is what we did. Enjoy! At sunset, I headed to the woods with my drum. I had been thinking about the course prompts for day 6 and found myself singing the little song above. On the way, I stopped to look at the magnolia tree that we planted in memory of my third baby, who died in my second trimester of pregnancy. His death-birth, my hemorrhage and hospital transfer after his birth, and the intense walk through grief that followed, was my death-life-rebirth experience that I’ve written about before–as well as a shamanic initiation into my priestess path and my dedication to the Goddess. 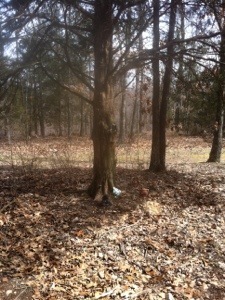 His memorial tree is beginning to bud. But I can sit, and watch, and wonder. I chopped out a bunch of saved stuff from a really wonderful article about using chants during rituals: Chants & Enchantment | M. Macha NightMare, Priestess & Witch. I’m saving this information for our personal study group rather than trying to include it in a dissertation format. We did a simple gratitude practice by placing corn kernels in a jar, one for each thing we are grateful for from the past month. We started out slowly and taking turns and then we sped up and the gratitude offerings came tumbling out, over one another. Even the one-year-old added corn, rapidly yet with great concentration to make it actually go in the jar. We drummed and called out, “We are ALIVE! We are GRATEFUL! We are POWERFUL! We are CREATIVE!” When we finally decided to close our ritual and go back inside, the moon peeked out from behind the clouds to briefly say hello and it felt like a blessing on the magic we’d just created together. As we went back inside, I felt relaxed, happy, and connected. For being something very simple, not particularly pre-planned, and semi-chaotic, it felt like one of our deepest and most connected personal family rituals. The quote above from Starhawk floated back into my mind and I reflected that when I try “too hard” to get things ready for a perfect ritual, I often end up feeling a little disappointed. Things might not work out as I envision or my kids might be as cooperative as I hope and it often takes longer than I expect. While I do enjoy getting some ambiance set up with candles, an altar, a mandala, or a fire, running outside with our glow sticks and spinning around together under the cloudy sky was more than enough to create a sense of magic. I then stayed up too late coloring mandalas with my daughter from our new free goddess greeting card set. I’ve only recently discovered the magic of sparkly gel pens. Such delight! New priestess robes hand-dyed by my dear friend are coming to the etsy shop this week! And, finally, in more practical terms, we were overwhelmed with Christmas ornament orders, which pared most of my personal practices and personal time down to almost nothing, by necessity. There were many nights where I fell asleep with my phone in my hand, after packing orders until 11:00, blog screen open, but untyped in…. Plant the seeds and wait to bloom. Change is coming, making room. Weave intention with her loom. Tonight I was out walking with my baby and the crescent moon was bright in the sky. I found myself singing a song to him as he fell asleep and so I thought I’d share it here too. Lots of good things happening this week. The workbook that we prepared to go with my upcoming Divination Practicum course turned into a gigantic, 340-page tome and so we’re having it shipped directly to the class participants. I’m thrilled with it and I hope they all will be too. It is important to me in my classes to go beyond pdfs and actually provide tangible materials. I also have big news in that we now have a dedicated portal for online classes at Mystery School of the Goddess! Even though it is really close to the start date, Divination Practicum Registration is live there now as our first official class. I’m in the process of developing several more classes (some with fees and some free!) that will have longer lead-in times. Taking the leap and signing up under Mystery School is a brand new decision and we moved the existing class (which was scheduled months ago to start on October 27th) to the new class platform, even though there isn’t really much time left to promote the offering. I also developed a Womanrunes 101 mini-class there that is totally free! Let us feast and bless the land. This morning, I strained my kombucha and started a new gallon. While doing so, I drank raspberry and nettle loose leaf tea I blended myself. I also strained my plantain infusion (from front yard) and made three tubs of plantain salve. Then, I strained and bottled my rose elixir made from my beloved back yard roses. 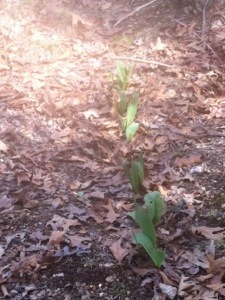 I reflected that there is a reciprocity between the healing offered by the land and offering healing to land. World ecology and personal ecology are inseparable. May we find healthy balance. One of my favorite images from the beautiful Gaian Tarot is the three of Earth. I thought of it today as I mixed up my own healing potions (it showed up in 30 Days of Harvest a couple of days ago as well). We feel the power of our hearts. We feel the power of our minds. We feel the power of our bodies. We feel the power of our family. We feel the power of our drum. Live the dream, let change begin. I’ve been reading one of my new books, Rituals of Celebration by Jane Meredith. It is really, really good. I have a lot of books about ritual planning and there is something beautifully, qualitatively different about this one. I think it is the stories with which she opens each section of the book (which is organized around a seasonal wheel of the year type of pagan calendar). She includes these beautifully evocative, very sensory and complete descriptions of rituals and their impact on participants/priestesses. I’ve felt tears come to my eyes multiple times as I read and for things I wouldn’t necessarily have expected—like the description of her son at thirteen challenging another man for the role of the God in their Beltane ritual. Her writing really touches something deep and brings her group’s rituals to life vibrantly. As I read the book, especially in combination with planning a ritual for our winter women’s retreat this weekend, I’ve noticed some insecurity come up (again!) about my own skills as a ritualist because I do not offer the type of elaborate pageant/performance type rituals that the author of this book offers. 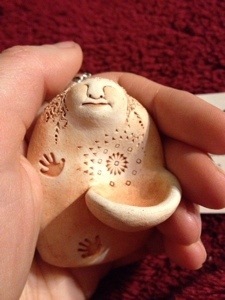 However, as I’ve been working on my Amazing Year workbook, I’ve also been thinking about a little sculpture that I bought to resell/give as a gift. She’s titled “Offering,” though to me she looks like she is about both receiving and giving. 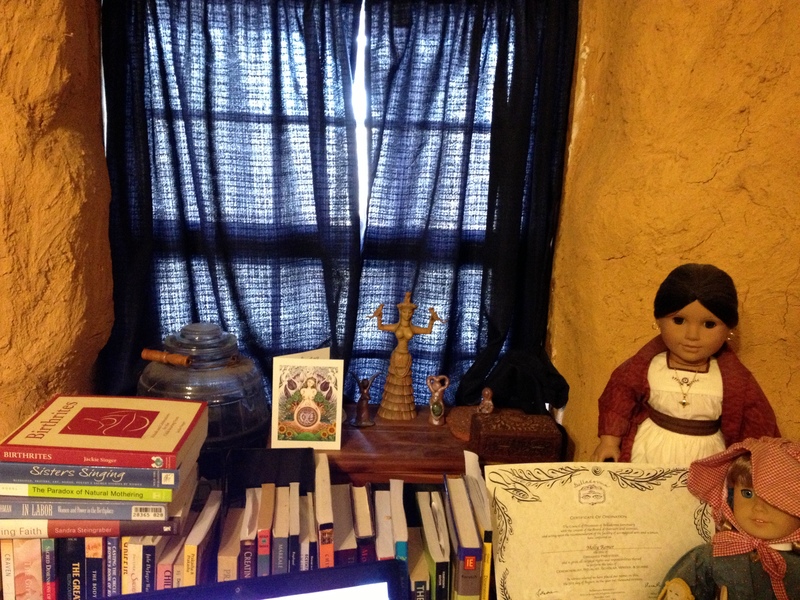 This afternoon, I decided that maybe she wants to stay with me for a while on my Amazing Year altar space-intention space and I’ve been thinking: what am I offering? I posted my thoughts to my Priestess Path group and asked, how about you? What are you offering right now? The day after Christmas I took some of the books I’d received as gifts down to the woods. 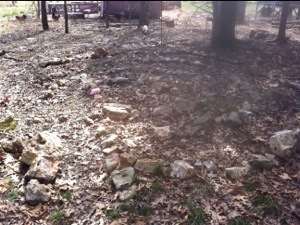 I laid them out the rocks and felt so appreciative of having a family who cares about me and what I’m interested in. 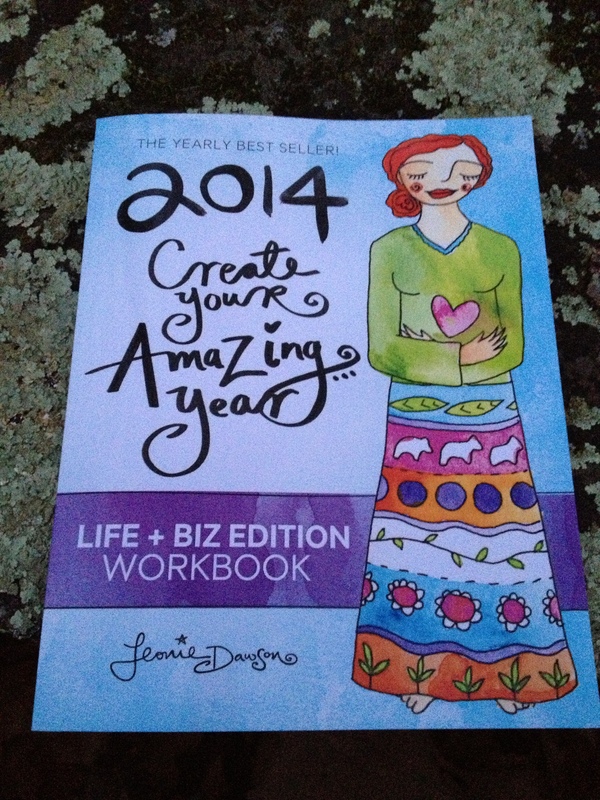 I got a selection of priestess books, other books from my Amazon wishlist, and the Amazing Year workbook from my friend. I felt so grateful to have a mom who looked at the picture of the pottery elemental altar I showed her in a magazine at some point this year and then worked and worked to make one for me as a surprise. I felt grateful that she comes to my rituals and reads my blog. I felt grateful for other family members and friends who read my blogs and cheer me on when I make new things and try new avenues. 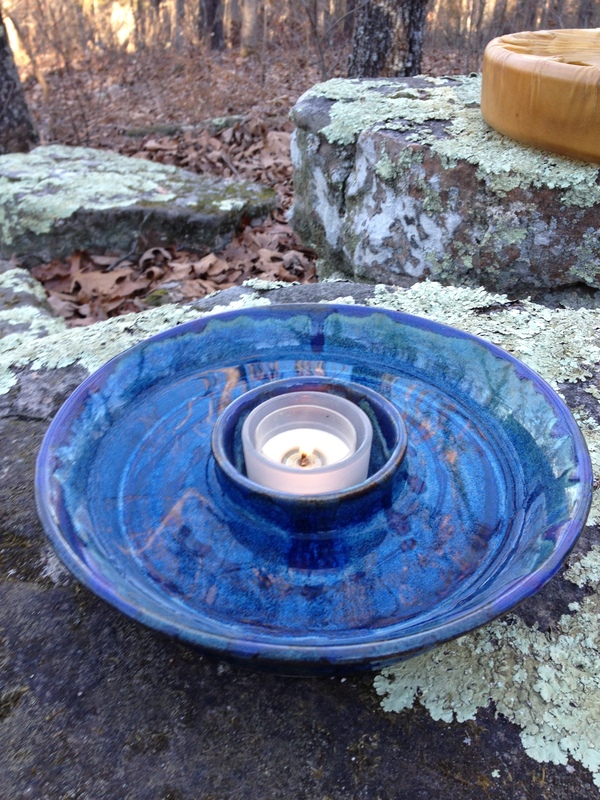 I felt grateful for parents who will hold candles in the darkness on solstice night with me, for a husband who will make a drum and cast pewter with me, for friends who support and encourage me and are able to accept when I need to make changes or let go of things. 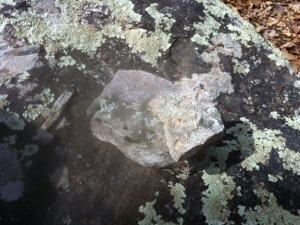 I felt grateful that I live in a beautiful place and that I have woods to go to and rocks to sit on. I felt grateful for the small adventures of the past year and even for the losses and the lessons of grief and change. Then, I picked up my drum and I sang a song. I feel like acknowledging that yes, I can see there are flaws in my lyrics in that they are perhaps roughly patterned and could be reworked into something smoother, but when I listened to the recording of it again I heard something authentic and something that worked for what it was, when it was. And, I decided I like it just the way it is. 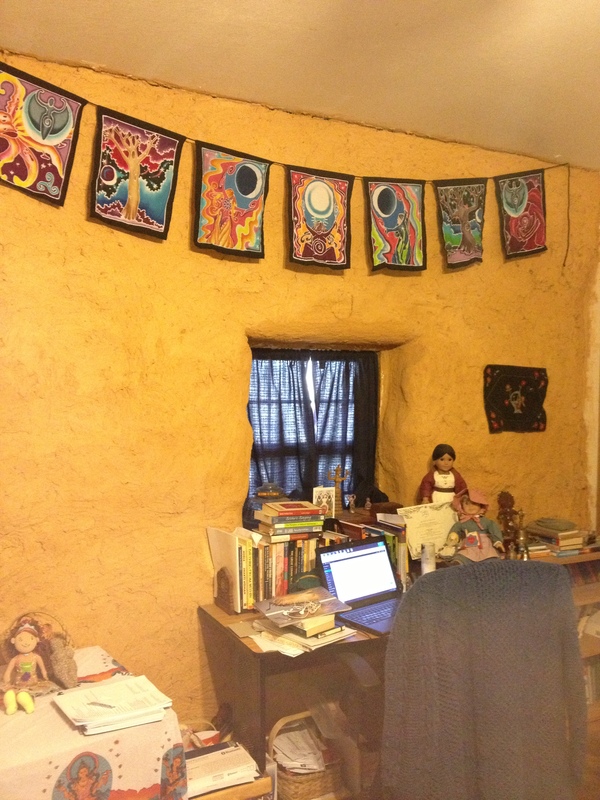 Today, I hung up the new goddess-ful Good Karma flags that my mom gave me for Christmas. They’re gorgeous and I loves ’em! BOOKS! Oh my first love, I will never forsake you! I was trying to take a different picture in the woods tonight and I believe this is actually a picture of my hair? Thought it seemed oddly suitable for tonight’s post. My favorite ones are definitely those by the Dolmen, especially Golden Sickel Sunrise, Frosty Solstice Morn, and Bringing the Outside In. The Jaiya ones are more wail-y as well as more traditional (i.e. “God send ye a happy new year”). Invocation to Mother Holle by Ruth Barrett is more of a chant and so might work for a group. Other suggestions gratefully welcomed. This is all I have! I’m not usually a rhyming type (at least in the woods. I have a tendency to annoy my kids by singing a little ditty at home that includes the phrase, “and it was rhyming time!”), but sometimes things surprise me and rhymes emerge after all! I’ve been missing my daily writing practice a lot. I hadn’t realized in full what it had added to my daily woodspractice. I’m writing more about this for my post for tomorrow. Today, I’m taking a day off from class work and I’m doing the other things that I want to do. I read to my kids, I played with my toddler, I packed for a trip, and got dinner started. I planned a gazillion blog post ideas. I made a baked sweet potato for my lunch. I haven’t checked in with my classes once and I think that is okay. Surely I deserve a day off from classwork, right?! 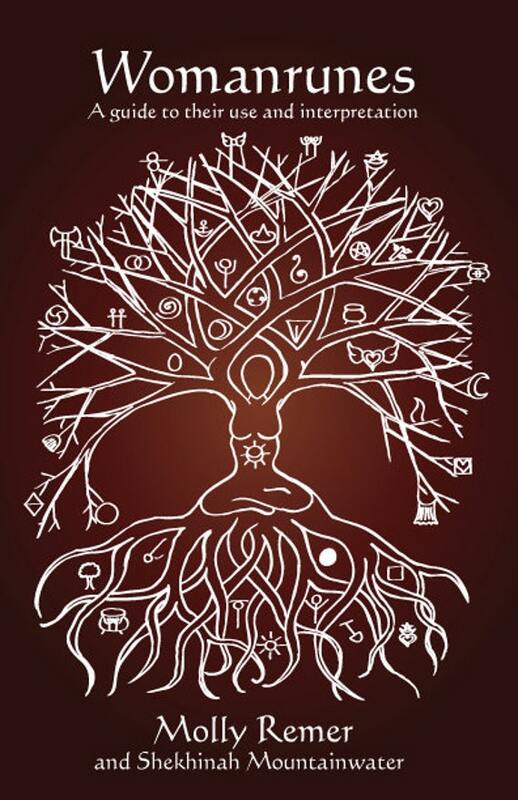 Living Goddess Spirituality: A Feminine Divine Priestessing Handbook is a wonderful book! Containing lots of good resources and thoughtful commentary, the book explores twelve goddesses and associated rituals and workshop ideas for women’s spirituality circles. 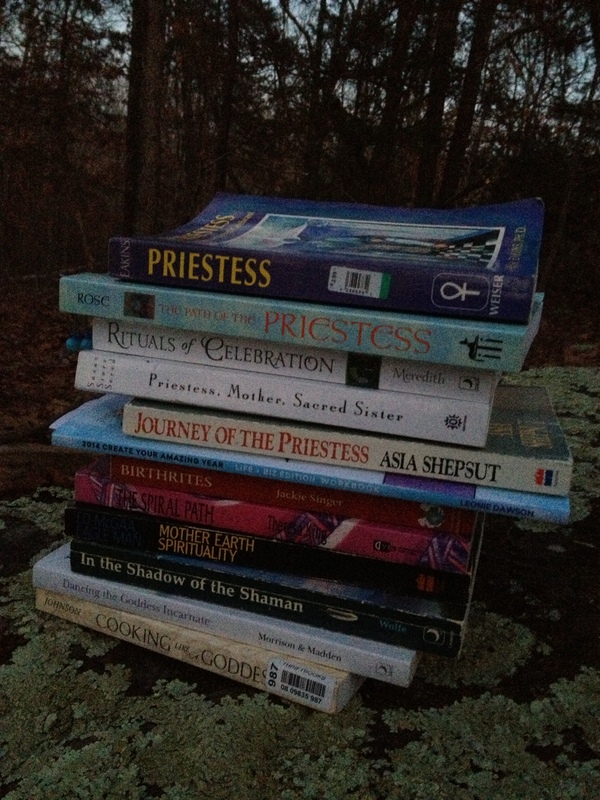 It also includes a chapter on priestess initiation and guidelines for starting a Goddess study circle. I have a couple of small critiques in that some of the print is extremely tiny, some material is repeated from the author’s previous book, there is quite a bit of repetitiveness in general, and not all suggestions are fully developed (i.e. for each goddess there are multiple “workshops” suggested which include things like making various items. However, no further information or instructions for most of these things are included). 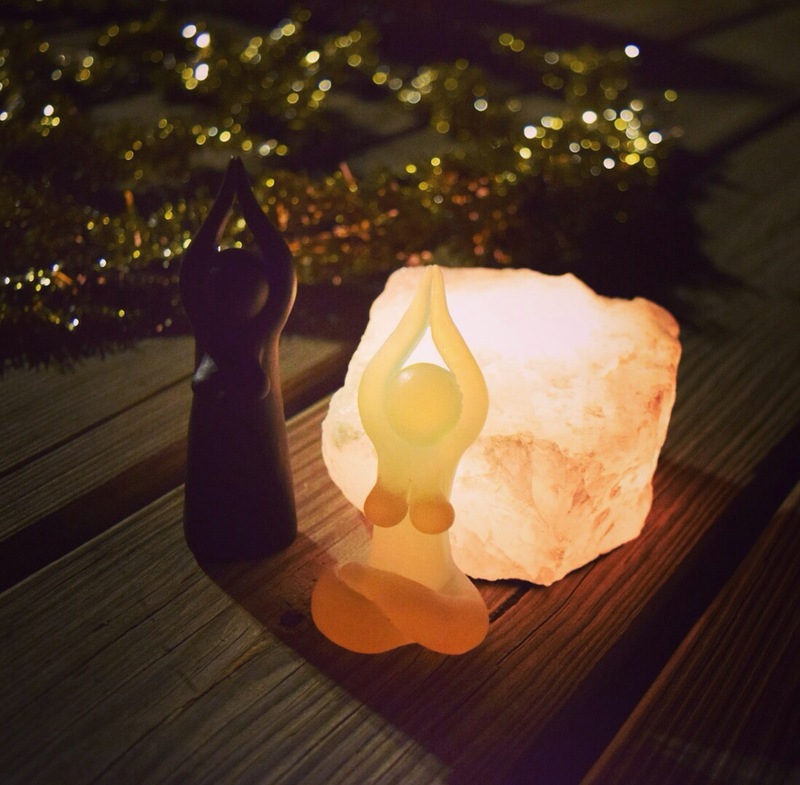 I don’t usually connect strongly with individual goddess imagery, but the way in which Living Goddess Spirituality is written brought in the significance of many different goddess images and I found myself learning and thinking about specific goddesses in different ways. I also loved all the different chants, ritual outlines, and invocations included. Really great pictures and some beautiful art enhance the book. 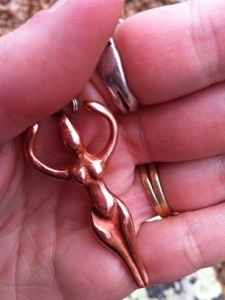 Great circle resource and a good resource for Goddess Priestesses! There is a Magick, I draw it in. Hear her Heartbeat, Pulsing through me. With my Singing, I call you here. eternal waters flowing on and on. Disclosure: Amazon affiliate links in image/book title.